Helping small businesses succeed through marketing, graphic design and printing. We have all read the articles stating “print is dead”, but it’s important to remember that we are physical beings who still crave physical communication. According to the Content Marketing Institute, two out of three marketing professionals now neglect to utilise print media as part of their marketing strategy. This means that they are missing out on great, valuable opportunities that digital marketing cannot tap into, thus limiting their success. As an example of this the biggest software firm in the world ‘Google’ still sends out printed direct mail to its Adwords users, highlighting the power of print. So why is printing still important in today’s digitally saturated world? With email marketing cluttering our inboxes on a daily basis, it is now more difficult than ever to ensure your business stands out from its competition. While this still remains a challenge, there is a huge gap in the number of businesses physically sending out printed marketing materials i.e. folded leaflets to potential clients. As a result, it is the perfect time to take advantage of the void by sending printed flyers and leaflets or targeting customers with brochure printing, which will prove to be a sure fire way to stand out from the crowd. 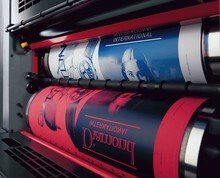 High quality printing maximises exposure and creates a lasting impact. Your customer can interact with print whenever they want, and at a time that suits them. Material can also be passed on to someone else who may be interested in your services, or picked up from a desk where it has been sitting for a while. Print marketing flairs up a genuine interest in your company without using disruptive techniques. Credibility Print offers credibility and legitimacy that digital can’t compete with. We inherently distrust much of the internet as we don’t know what is behind the webpage, especially after hearing of the horror stories in the media, couple this with the saturation of popups and banner ads on the web, which can be overwhelming and the fear of spam and viruses is enough to make people weary of clicking, there is no imminent danger of this in a print ad. Therefore we tend to purchase from websites that we know are genuine trustworthy businesses and print media reinforces that mindset and improves your brand trust level. Branding Print adverts are excellent for improving your brand awareness and solidifying your brand identity. Remember that your adverts should be consistent aesthetically in terms of fonts, colors and types of images to establish brand recognition and ensure that these are replicated in the digital marketing channels. Target Marketing Placing adverts in printed brochures such as specialty magazines can effectively and cost efficiently reach niche audiences that may be more difficult to target online.